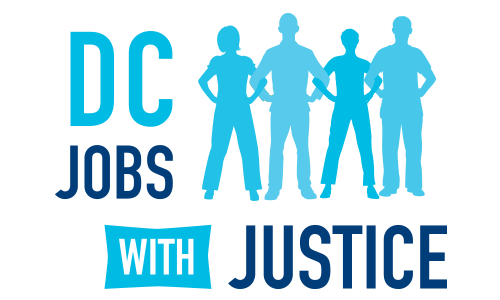 Washington, D.C. – TODAY, Wednesday, January 13, at 9:30 a.m., a broad coalition of business owners, retail and food service employees, community leaders and councilmembers will hold a press conference to discuss progress on legislation that would bring more stable schedules and fuller employment to thousands of people who live and work in the District. Following the press conference, members of the coalition will testify at a hearing on the bill. Council bill 21-512, the Hours and Scheduling Stability Act, spearheaded by D.C. Jobs With Justice and introduced by at-large Councilmember Vincent Orange, would require large retail and restaurant chains to provide their employees with advance notice of schedules, promote full-time work opportunities, end “on-call” schedules and ensure equal treatment for hourly employees. Washington, D.C. – This afternoon, D.C. Councilmembers introduced legislation that would usher in more predictable schedules and stable employment opportunities for people working in retail and restaurant chains in the District. The Hours and Scheduling Stability Act, spearheaded by D.C. Jobs With Justice and introduced by Councilmember Vincent Orange, would require large retail and restaurant chains to provide their employees with advance notice of schedules, promote full-time work opportunities, end “on-call” schedules and ensure equal treatment for hourly employees. The bill was co-introduced by Councilmembers Mary Cheh, Brianne Nadeau and Elissa Silverman, and co-sponsored by Counclmembers Charles Allen, David Grasso, LaRuby May and Brandon Todd. Washington, D.C. – TODAY, Tuesday, December 1, legislation that would usher in more predictable schedules and stable employment opportunities for people working in retail and restaurant chains in the District will be introduced to the D.C. Council. The Hours and Scheduling Stability Act, spearheaded by D.C. Jobs With Justice and introduced by Councilmember Vincent Orange, would require large retail and restaurant chains to provide their employees with advance notice of schedules, promote full-time work opportunities, end “on-call” schedules and ensure equal treatment for hourly employees. According to a recent two-part survey, 86 percent of D.C. residents said they would support legislation that would mandate stable hours and predictable work schedules from employers. Additionally, 87 percent of those surveyed said they would support rules that would require two weeks’ advance notice of work schedules, and 88 percent said they would support rules that would require large corporate chain stores and restaurants to first offer additional work hours to their part-time employees before hiring new employees.